Forta for Men is a new, remarkably fast acting, all natural sexual enhancement product that makes the most of your natural potential. Forta for men is part of a new generation of quick acting, long lasting and Yang tonifying products. Once it has been consumed, an erection usually takes place within 45 minutes, and the effects can last for 2 to 3 days. It is made with only the purest ingredients to ensure the absolute best quality and efficiency. 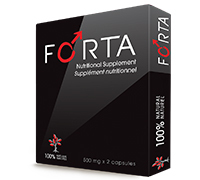 Forta for Men has been developed for men looking to fortafy their sexual performance, as well as the frequency and intensity of their sexual encounters. 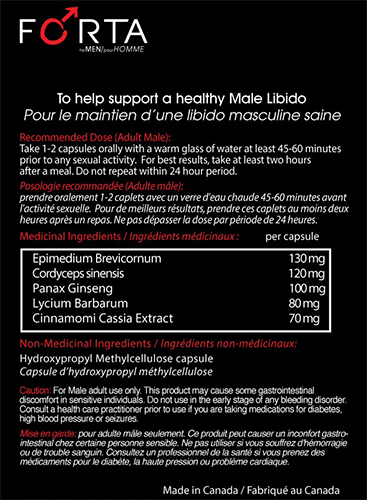 Recommended use: Take one or two capsules with a warm glass of water at least 45 to 60 minutes prior to any sexual activity. For best result take two hours after a meal. Do not exceed the recommended dose and do not repeat within a 24hr period.